Not to be mistaken for Escape from Witch Mountain, even though this film has some parallels, Under the Mountain is based on the novel of the same name by New Zealand author Maurice Gee and is a relatively above average children/family action adventure film. The two main protagonists in Under the Mountain are twins, Rachel (Sophie McBride) and Theo (Tom Cameron) who just lost their mother in a car accident. Unable to come to terms with his grief, his father sends them to Auckland where they stay with their uncle Cliff (Matthew Chamberlain), aunt Kay (Micheala Rooney) and cousin Ricky (Leon Wadham). Although initially, the twins are apprehensive about their country move but as they explore the surroundings, they soon stumble upon a strange mystery that dates back to the 1800’s. This strange mystery is Mr. Jones (Sam Neil) who has the ability to control fire around the volcanoes of Auckland. The twins soon learn that they are destined to help Mr. Jones who has been searching for these twins since 1879 and are required to defeat the Gargantuans, monster like creatures whose goal is to enslave the Earth for their masters, the Wilberforces. At times, the children feel like the characters out of the recent Disney movie, Escape from Witch Mountain but interestingly enough, this is actually a more believable plot in terms of science fiction and fantasy. At times the story may be clichéd and over the top but the actors in the film, especially McBride, Cameron and Neil really captured the hearts of their characters which easily allowed you to form a bond with them. You actually cared for the characters. Director Jonathan King (Black Sheep) also makes good use of New Zealand’s amazing landscapes and the cinematography is visually quite impressive with some amazing use of colours. This in turn relates well to the widescreen presentation with sharp images, vibrant colours and a perfect transfer to DVD. The soundtrack really rumbles at certain points that uses the surround sound technology well as does the immersive soundtrack. 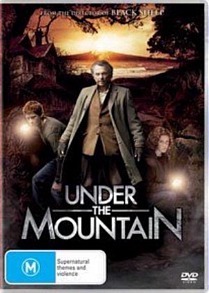 In terms of extra, Under the Mountain contains commentary by Jonathan King and writer Matthew Grainger, a Making of Feature and some other trailers. It’s definitely a movie that can be watched by the entire family and considering that school holidays are coming, this is definitely a must have buy or rental. Recommended!